OUR MISSION: Dedicated to helping all students achieve their full academic potential. We are a small, rural K-12 school district in southwest Calhoun County, Michigan. Athens Jr/Sr High School, housing grades 6-12, is located in the Village of Athens, two blocks east of M-66 and about 13 miles south of I-94/Battle Creek. The Athens Middle School Gymnasium sits across the football bowl and track, in the former middle school building. East Leroy Elementary School, housing grades K through 5 with our administrative office, is located in East Leroy, just west of M-66 and about 6 miles north of the main campus. Check out the pages for each school..
We are a Class D member of the Michigan High School Athletic Association. Our elementary and high school both excel academically and in a number of other areas, as well, including Youth in Government, civic education and service learning, and student journalism. ​WHY CHOOSE ATHENS AREA SCHOOLS? 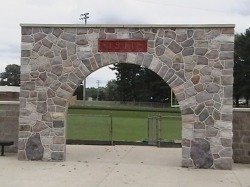 The historical arch at the entrance to the football field and track was reconstructed from the 1910 Athens school.